some of our shy kitties have special friends at our rescue. Adopting with another fur friend helps to make the new transition less scary for both. If you have some extra love for a second cat, often one of the bonded duos makes the breakthrough, then the 2nd cat will follow its friend’s path. When you see them starting bond with you, it’s the best feeling in the world!!!!!!!! 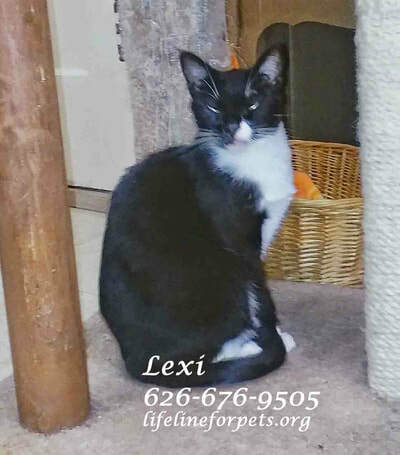 Scroll to see our GALLERY of shy kitties who need stability, gentleness, & patience. and those who understand it is going to be a little time to win their trust and love. With time, lots of TLC and a calm, environment,they will settle in and blossom. Want to do a good deed? First, know what to expect by reading the info at the bottom of this page. Please view to see how one of our amazing socializers works with our kitties, some of whom were very skittish a year ago. Our socializers use positive reinforcement and patience (lots of that), treats, and petting when the cat allows it. However, these wonderful people are spread very thin, and we need to get some of the cats into a foster home so their progress can be faster. Click on any picture to learn more or to enlarge the picture. Hover over any picture to see the caption. 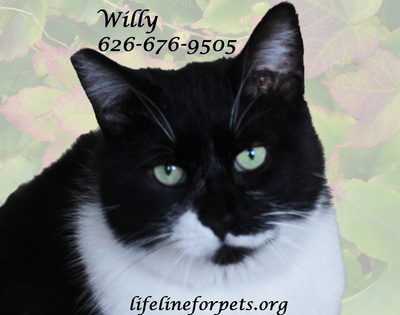 WILLY, male tuxedo, born 2006, has only known life at our cat pad. Loves treats and is making progress socially. He's on our Seniors page. 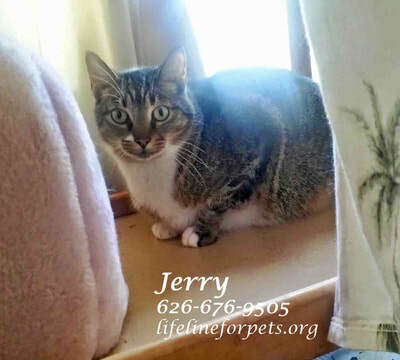 Sponsored by Joelle D.
Farley Mowcat, male gray tabby & white, born approx. 2009. Very shy & skittish. Adorable face! 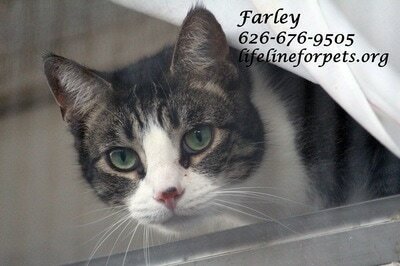 Farley is sponsored by Janet Wall. 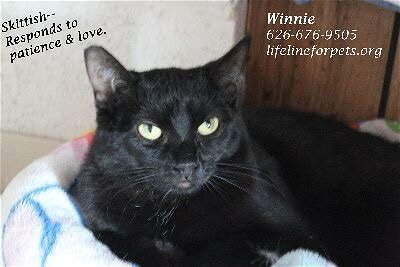 WINNIE, female black SH, born 2015, very shy, almost semi-feral, but loves treats. Click for her video. 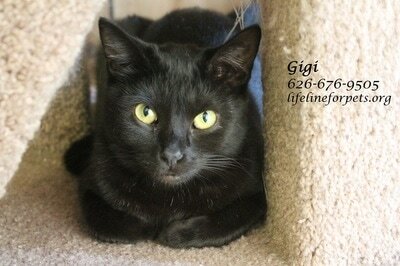 GIGI, female black SH, born 2015, very shy but making progress. Sponsored by PASADENA COURIER, INC. pasadenacourierinc.com. THANK YOU! 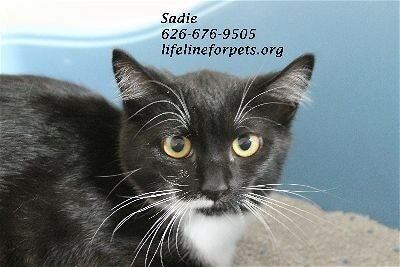 SADIE, female tuxedo, MH, born 11/2015, very shy & skittish, hides a lot. Is Teddie's sister. 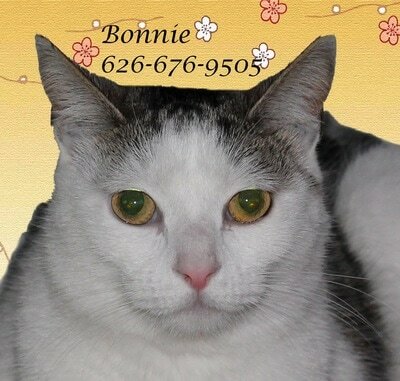 BONNIE, female white/tabby, SH, born 5/2012. Please click her picture to read her message. 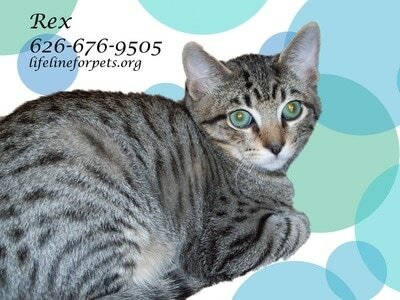 REX, male tabby with gorgeous aqua eyes. Very skittish but making progress with the help of treats. Ricky's brother. Born 12/2011. Click this pic for his video page. 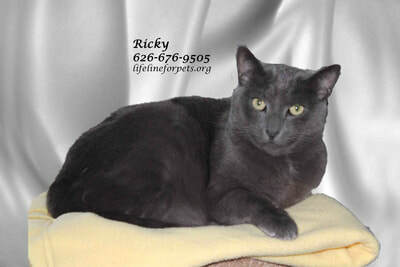 RICKY, male SH, Russian Blue mix. Very shy but wants to be brave. Likes treats. Born 12/2011. Click this pic for his video page. 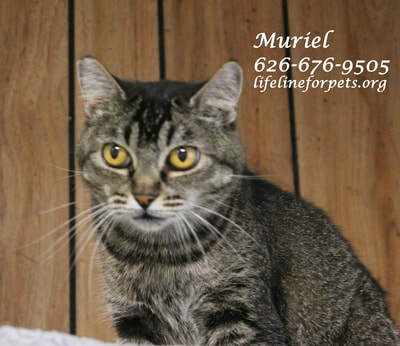 MURIEL, female tabby, very skittish but making progress! Click this pic for her video page. 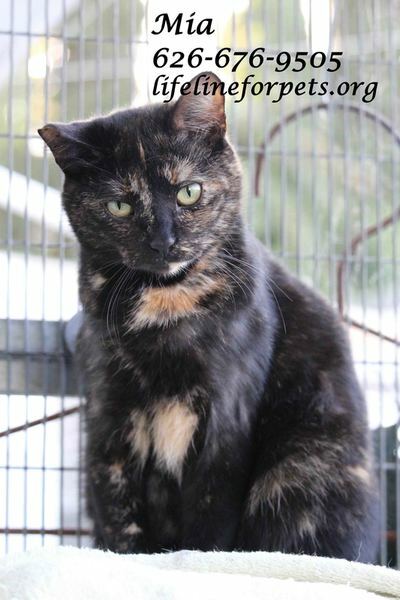 Mia - born 2013, semi-feral but may bond in time with a quiet home. SPONSORED BY JULIE ESSER--Thank you! Jerry, born 2011. Feral. Hides a lot. We hardly ever see him! Had a brother named Tom who has since crossed the Rainbow Bridge Call 626-676-9505 for more info. Trouper, unknown birthdate. Our most elderly. Had a very tough life on the streets, but is now doing well enough. Needs a loving home to see him through his golden years. SPONSORED by Joelle D. Thank you!! Lexi, born 2011, one of our most skittish. We hardly ever see her! Daisy, born 2015. Very skittish, but wants to change! Click & scroll down to see both Minnie and Daisy. IN FOSTER HOME. Shy? Feral? What's the Difference? 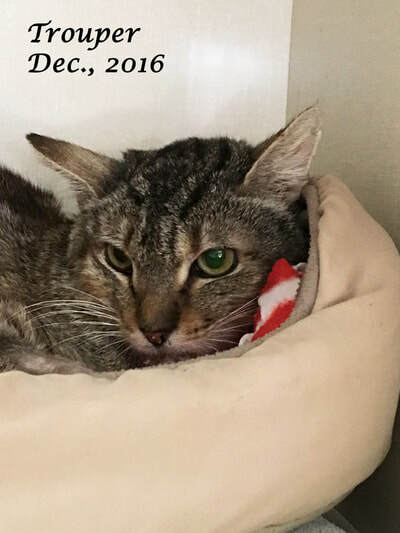 Shy and semi-feral kitties will bond with their adopter, although it might take them a little longer to come out of their shell. A feral born kitty will realize who is taking care of them. They often will seek love on their terms, which could be sitting near you, coming to you, and they do better in a quieter home. They may not be a cuddle type of cat, but usually they do like to play with strings or toys. One just has to be patient. 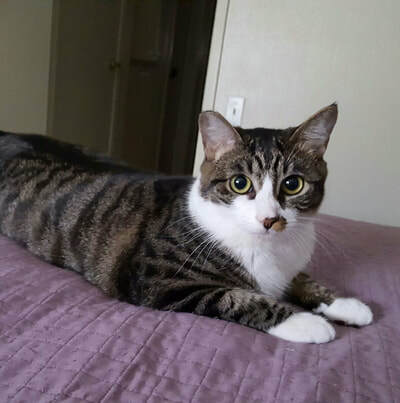 In contrast, a shy kitty will most likely cuddle on your bed, want to be around you, and will come to you seeking affection and pets. Shy kitties do everything a more outgoing kitty will do, but on a smaller scale. Often, shy cats (even ferals) turn the corner and just love their adopters. Maybe not strangers or anybody else, but they love the one who feeds them, talks to them, gives them blankets and beds to cuddle up in. As we always say, we've seen miracles happen with patience, treats, and sweet-talk! Grandpa Mason, the transformation of a hard-core, feral cat. Man takes a chance on cat cowering in the corner, & 90 minutes later . . .